Regina Montag was born on 17 May 1890 at Paris, Grant, Wisconsin. She was the daughter of Michael Montag and Catherine Brant. [S245] U.S. Federal Census 1900 U.S. Federal Census, by Ancestry.com, Year: 1900; Census Place: Mayhew Lake, Benton, Minnesota; Roll: 757; Page: 1A; Enumeration District: 0314; FHL microfilm: 1240757. Name Variation Andrew Joseph Brandt was also known as Brant. Andrew Joseph Brandt married Victoria Witherholt. Andrew Joseph Brandt was born on 5 July 1819 at Prussia. Andrew Joseph Brandt died on 3 October 1896 at age 77. Name Variation Victoria Witherholt was also known as Wiederholdt. Married Name Her married name was Brant. Victoria Witherholt married Andrew Joseph Brandt, son of Barthel Joseph Brandt and Margaretha Palmer. Victoria Witherholt was born on 7 December 1824 at Prussia. She died on 22 January 1908 at age 83. Henry A. Montag was born in June 1872 at Wisconsin. He was the son of Michael Montag and Catherine Brant. Henry A. Montag died on 23 December 1927 at Seattle, King, Washington, at age 55. Name Variation Justin Montag was also known as Justina. Justin Montag was born circa 1874 at Wisconsin. Justin Montag died before 1900. Name Variation Charles Montag was also known as Charley. Charles Montag was born on 3 March 1875 at Dickeyville, Grant, Wisconsin. As of 1920, Charles Montag was never married. Mother: Katherine Brant. He was a mason in 1918. On 12 September 1918 at Nelson, Lakota, North Dakota, nearest relative Frank Ulrich in St. Cloud, MN. [S243] U.S. Federal Census 1920 U.S. Federal Census, by Ancestry.com, Year: 1920; Census Place: St Cloud Ward 4, Stearns, Minnesota; Roll: T625_863; Page: 12B; Enumeration District: 211; Image: 332. Name Variation Dorothea Montag was also known as Dora. Married Name circa 1905 As of circa 1905,her married name was Ulrich. Dorothea Montag was born in October 1876 at Wisconsin. Dorothea Montag married Frank T Ulrich circa 1905. Andrew Montag was born in June 1881 at Wisconsin. Martha Montag was born in April 1884 at Wisconsin. Name Variation Helena Gertrude Duve was also known as Lena G.
Married Name 26 February 1906 As of 26 February 1906,her married name was Vondran. Married Name 26 February 1906 As of 26 February 1906,her married name was Voudrum. Married Name 26 February 1906 As of 26 February 1906,her married name was Vondrum. Helena Gertrude Duve was born on 16 July 1882 at Grant, Wisconsin. She was the daughter of Bernard John Duve and Anna B. Richter. Helena Gertrude Duve married Andrew Vondrum, son of Joseph Vondran and Mary Anna Brandt, on 26 February 1906 Lena Duve and Andrew Voudrum (Vondran) marriage announcement. Helena Gertrude Duve died on 11 March 1974 at Grant, Wisconsin, at age 91 Mrs. Helena "Lena" Vondrum, 91, of Cassville, Wisconsin, died Monday morning, March 11, 1974, at home. Visitation was after 2 p.m., Tuesday, March 12, at the Metcalfe-Kuenster Funeral Home in Cassville, where the Rosary was said at 7:30 p.m. Funeral services were at 10:30 a.m., Wednesday, March 13, at St. Charles Borromeo Catholic Church in Cassville, and burial was in the church cemetery. Mrs. Vondrum was survived by three sons, Bernard Vondrum, Harold Vondrum, and Vincent Vondrum, all of Cassville, Wis; 7 grandchildren, 28 great-grandchildren, and 1 great-grandchild; and four sisters, Mrs. Mathilda Klein, of Dubuque, Ia., Mrs. Carrie Flesch, of Great Falls, Mont., Mrs. Dora Leeser of Potosi, Wis., and Mrs. Martha Brandt, of Cuba City, Wis.
She was buried after 11 March 1974 at Saint Charles Catholic Church Cemetery, Cassville, Grant, Wisconsin. [S245] U.S. Federal Census 1900 U.S. Federal Census, by Ancestry.com, Year: 1900; Census Place: Potosi, Grant, Wisconsin; Roll: T623_1790; Page: 8A; Enumeration District: 51. Name Variation Mary Susan Duve was also known as Susie. Name Variation Mary Susan Duve was also known as Susan. Married Name 18 September 1907 As of 18 September 1907,her married name was Brandt. Mary Susan Duve was born on 3 December 1883 at Potosi, Grant, Wisconsin. 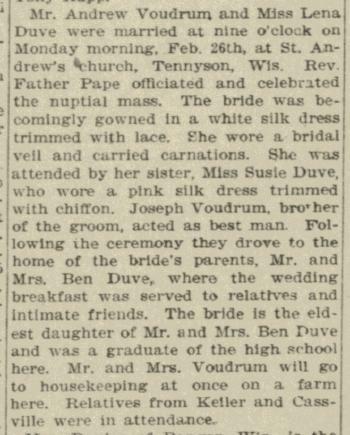 Mary Susan Duve was the maid of honor at the wedding of Andrew Vondrum and Helena Gertrude Duve on 26 February 1906; Lena Duve and Andrew Voudrum (Vondran) marriage announcement. Mary Susan Duve married Sylvester Joseph Brandt, son of Cyralus John Brandt and Appolonia Bishop, on 18 September 1907 at Tennyson, Grant, Wisconsin, Sylvester Brandt and Susie Duve marriage announcement. Mary Susan Duve died on 12 June 1935 at Finley hospital, Dubuque, Iowa, at age 51 Susan (Duve) Brandt obituary. She was buried after 12 June 1935 at Immaculate Conception Church Cemetery, Kieler, Grant, Wisconsin. 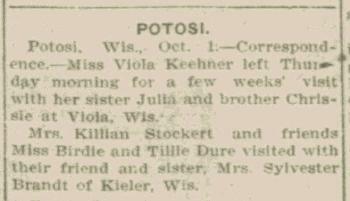 In October 1907 at Potosi, Grant, Wisconsin, Sylvester and Susan (Duve) Brandt visited her parents, Bernard and Anna (Richter) Duve last Tuesday and Wednesday (surname misspelled Rure). In October 1907 at Potosi, Grant, Wisconsin, Birdie and Tillie Duve (Dure) visited with their sister, Mrs Sylvester (Susan) Brandt. Name Variation Dora Amelia Duve was also known as Dorothea Amelia. Name Variation Dora Amelia Duve was also known as Dora Emilia. Married Name May 1906 As of May 1906,her married name was Leeser. Dora Amelia Duve was born on 5 October 1885 at Potosi, Grant, Wisconsin. Dora Amelia Duve married Leo Bernhard Leeser, son of Joseph Leeser and Anna Marie Burggraf, in May 1906 Leo Leeser and Dora Duve marriage announcement. Dora Amelia Duve died on 28 September 1980 at Grant, Wisconsin, at age 94. She was buried after 28 September 1980 at Saint Thomas Cemetery, Potosi, Grant, Wisconsin. Name Variation Bertha E. Duve was also known as Birdie. Married Name circa 1914 As of circa 1914,her married name was Bode. Bertha E. Duve was born in November 1887 at Wisconsin. Bertha E. Duve was a bridesmaid at the wedding of Johann Joseph Scholl and Clara Katherine Duve in February 1909; Joseph Scholl and Clara Duve marriage announcement. Bertha E. Duve married Andrew Bode, son of Joseph Bode and Anna Weber, circa 1914. Bertha E. Duve witnessed the burial of Joseph Diener in February 1944 at Linwood Cemetery, Dubuque, Dubuque, Iowa. Bertha E. Duve died between 1954 and 1967. 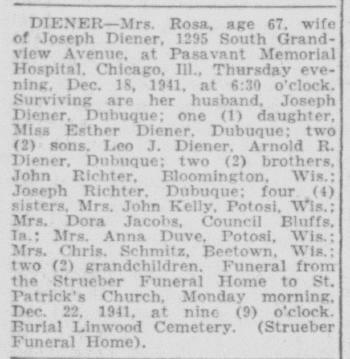 She witnessed the death of Anna B. Richter on 30 April 1954 at Iowa; Mrs Anna (Richter) Duve, 95, obituary. In July 1952 Anna (Richter) Duve celebrates 95th birthday. [S244] U.S. Federal Census 1910 U.S. Federal Census, by Ancestry.com, Year: 1910; Census Place: Potosi, Grant, Wisconsin; Roll: T624_1711; Page: 12B; Enumeration District: 0043; Image: 505; FHL Number: 1375724. Name Variation Mary Caroline Duve was also known as Carrie. Name Variation Mary Caroline Duve was also known as Caroline Mary. Married Name 28 June 1910 As of 28 June 1910,her married name was Flesch. Mary Caroline Duve was born on 3 April 1890 at Wisconsin. Mary Caroline Duve married Charles Simon Flesch on 28 June 1910. Mary Caroline Duve died on 2 May 1984 at Wisconsin at age 94. She was buried after 2 May 1984 at Saint Phillips Catholic Cemetery, Rolling Ground, Crawford, Wisconsin. Name Variation Matilda Mary Duve was also known as Tillie. Married Name 22 October 1912 As of 22 October 1912,her married name was Klein. Matilda Mary Duve was born in October 1892 at Wisconsin. Matilda Mary Duve married Henry Joseph Klein, son of Joseph Klein and Emma Frances Kehrer, on 22 October 1912. Matilda Mary Duve died on 28 October 1986 at Wisconsin. She was buried after 28 October 1986 at Saint Thomas Cemetery, Potosi, Grant, Wisconsin. Married Name 25 June 1917 As of 25 June 1917,her married name was Brandt. Martha M. Duve was born on 14 February 1897 at Wisconsin. 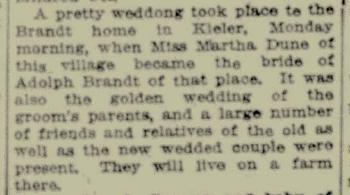 Martha M. Duve married Adolph Joseph Brandt, son of Cyralus John Brandt and Appolonia Bishop, on 25 June 1917 at Kieler, Grant, Wisconsin, Martha Duve and Adolph Brandt marriage announcement and celebration of his parents, Mr and Mrs Silas Brandt, 50th wedding anniversary. Martha M. Duve died in June 1987 at Grant, Wisconsin, at age 90. Margaret Duve was born in August 1899 at Wisconsin. She was the daughter of John Joseph Duve and Bertha Elizabeth VanNatta. Name Variation John Wilhelm Duve was also known as William. John Wilhelm Duve married Helena Caroline Burggraf. John Wilhelm Duve was born on 12 March 1810 at Prussia. He died on 19 August 1894 at Potosi, Grant, Wisconsin, at age 84. Name Variation Helena Caroline Burggraf was also known as Caroline. Married Name Her married name was Duve. Helena Caroline Burggraf married John Wilhelm Duve. Helena Caroline Burggraf was born on 22 March 1822 at Prussia. She died on 4 January 1900 at Potosi, Grant, Wisconsin, at age 77. John Jacob Duve married Mary Magdalena Wilhelm. John Jacob Duve was born on 3 October 1851 at Potosi, Grant, Wisconsin. John Jacob Duve died on 7 August 1919 at Grant, Wisconsin, at age 67. Name Variation John William Duve was also known as John Wilhelm. John William Duve married Helena Mary Ehlen. John William Duve was born on 12 March 1858 at Wisconsin. John William Duve died on 13 December 1942 at Potosi, Grant, Wisconsin, at age 84. John Peter Duve married Anna Haser. John Peter Duve was born on 11 February 1861 at Wisconsin. Name Variation Lillian D. Kelly was also known as Lillie. Name Variation Lillian D. Kelly was also known as Kelley. Lillian D. Kelly married Joseph C. Reynolds. Lillian D. Kelly was born in March 1892 at Wisconsin. She was the daughter of John Kelly and Mary Richter. Lillian D. Kelly died on 2 October 1981 at Grant, Wisconsin, at age 89. She was buried after 2 October 1981 at Saint Thomas Cemetery, Potosi, Grant, Wisconsin. [S245] U.S. Federal Census 1900 U.S. Federal Census, by Ancestry.com, Year: 1900; Census Place: Potosi, Grant, Wisconsin; Roll: T623_1790; Page: 6B; Enumeration District: 51. Married Name Her married name was Baumler. Name Variation Ella Mary Kelly was also known as Kelley. Ella Mary Kelly married Charles V. Baumler. Ella Mary Kelly was born on 26 January 1895 at Wisconsin. 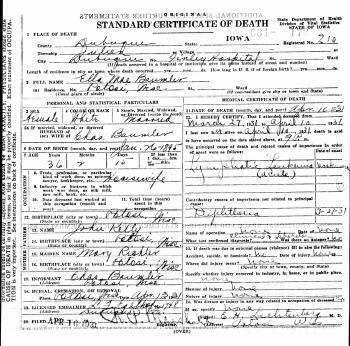 Ella Mary Kelly died on 10 April 1931 at Julien, Dubuque, Iowa, at age 36 Death certificate of Ella Mae (Kelly) Baumler. She was buried after 10 April 1931 at Saint Thomas Cemetery, Potosi, Grant, Wisconsin. Name Variation Margaret M. Kelly was also known as Mary Margaret. Married Name Her married name was Faherty. Name Variation Margaret M. Kelly was also known as Kelley. Margaret M. Kelly married W.R. Faherty. Margaret M. Kelly was born in January 1897 at Wisconsin. Name Variation Mary Elizabeth Neid was also known as Mary Eliza. Name Variation Mary Elizabeth Neid was also known as Neit. Name Variation Mary Elizabeth Neid was also known as Elizabeth. Married Name 24 July 1864 As of 24 July 1864,her married name was Richter. Married Name 24 July 1864 As of 24 July 1864,her married name was Richard. Mary Elizabeth Neid was born on 5 March 1838 at Prussia. She married John Richter, son of John Balthasom Richard and Rosine Montag, on 24 July 1864 at first marriage for her; second for him. Mary Elizabeth Neid died on 5 June 1912 at age 74. She was buried after 5 June 1912 at Saint Andrews Cemetery, Potosi, Grant, Wisconsin. 1 June 1905 Potosi, Grant, Wisconsin Mary Elizabeth Neid appeared on the census of 1 June 1905 in the household of John Richter at Potosi, Grant, Wisconsin. Mary Elizabeth Neid immigrated in 1863. She had 4 with 3 living in 1900 children. She had 4 with 3 living in 1910 children. [S247] U.S. Federal Census 1870 U.S. Federal Census, by Ancestry.com, Year: 1870; Census Place: Potosi, Grant, Wisconsin; Roll: M593_1717; Page: 436B; Image: 480; Family History Library Film: 553216. [S246] U.S. Federal Census 1880 U.S. Federal Census, by Ancestry.com, Year: 1880; Census Place: Potosi, Grant, Wisconsin; Roll: 1427; Family History Film: 1255427; Page: 357A; Enumeration District: 124; . [S244] U.S. Federal Census 1910 U.S. Federal Census, by Ancestry.com, Year: 1910; Census Place: Potosi, Grant, Wisconsin; Roll: T624_1711; Page: 6A; Enumeration District: 0043; ; FHL microfilm: 1375724. Name Variation Albert Richter was also known as Richard. Albert Richter was born on 28 February 1866 at Wisconsin also reported as Jan 1867. He was the son of John Richter and Mary Elizabeth Neid. Albert Richter married Alice M. Ringland on 24 February 1892. Albert Richter married Pauline Walter before 1932. Albert Richter was buried in May 1932 at Van Buren Cemetery, Potosi, Grant, Wisconsin. 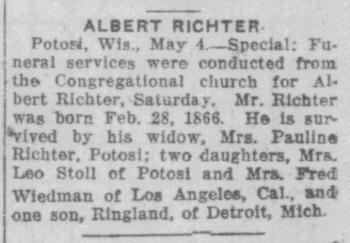 He died in May 1932 at age 66 Albert Richter obituary. [S243] U.S. Federal Census 1920 U.S. Federal Census, by Ancestry.com, Year: 1920; Census Place: Potosi, Grant, Wisconsin; Roll: T625_1988; Page: 5A; Enumeration District: 123; Image: 431. Name Variation Caroline Richter was also known as Richard. Caroline Richter was born circa 1869 at Wisconsin. She was the daughter of John Richter and Mary Elizabeth Neid. Caroline Richter died before 1880. Name Variation Margaret Richter was also known as Richard. Name Variation Margaret Richter was also known as Maggie. Married Name 1 June 1904 As of 1 June 1904,her married name was Smith. Married Name 1 June 1904 As of 1 June 1904,her married name was Schmidt. Married Name 1 June 1904 As of 1 June 1904,her married name was Schmitz. Margaret Richter was born in October 1871 at Wisconsin. Margaret Richter married Christian H. Schmitz on 1 June 1904 at first marriage for both. Margaret Richter witnessed the death of John Richter on 13 July 1916 at at the home of his daughter, Beetown, Wisconsin; John Richter obituary. Margaret Richter was buried in 1961 at Saint Andrews Cemetery, Potosi, Grant, Wisconsin. [S244] U.S. Federal Census 1910 U.S. Federal Census, by Ancestry.com, Year: 1910; Census Place: Beetown, Grant, Wisconsin; Roll: T624_1710; Page: 6A; Enumeration District: 0014; ; FHL microfilm: 1375723. [S250] U.S. Federal Census 1930 U.S. Federal Census, by Ancestry.com, Year: 1930; Census Place: Beetown, Grant, Wisconsin; Roll: 2574; Page: 7A; Enumeration District: 2; Image: 21.0; FHL microfilm: 2342308. [S373] U.S. Federal Census 1940 U.S. Federal Census, by Ancestry.com, Year: 1940; Census Place: Beetown, Grant, Wisconsin; Roll: T627_4481; Page: 12B; Enumeration District: 22-2. Name Variation Rosa M. Richter was also known as Richard. Married Name circa 1898 As of circa 1898,her married name was Diener. Rosa M. Richter was born on 18 October 1874 at Tennyson, Grant, Wisconsin. Rosa M. Richter married Joseph Diener circa 1898 at Illinois. Rosa M. Richter died on 18 December 1941 at Chicago, Cook, Illinois, at age 67 Mrs. Rosa Diener, 67, of South Grandview Avenue in Dubuque, Iowa, died at Pasavant Memorial Hospital in Chicago, Illinois, at 6:30 o'clock Thursday evening, December 18, 1941, following a brief illness. The body was available for viewing at the Strueber Funeral Home in Dubuque after 2 o'clock, Saturday afternoon, December 20. The funeral was held Monday morning, December 22, from the Strueber Funeral Home to St. Patrick's Church in Dubuque, where the Rev. Duane Brady sang the requiem mass and delivered the sermon. The St. Patrick's Vested Boys Choir sang at the mass. Burial was in Linwood Cemetery in Dubuque, where Father Brady also officiated. Pallbearers were Arthur A. Meyer, John Kintzinger, John Cottingham, Ned Fratus, George Jansen, and John Gantz. Out-of-town persons attending the funeral were Mr. and Mrs. Chris Schmitz, Beetown, Wis; Harry Schmitz, Chicago; Mr. and Mrs. Herman Richter, Bloomongton, Wis; John Kelly, Mrs. J. Reynolds, Mr. and Mrs. Andrew Bode, and Miss Mary Neid, all of Potosi, Wis; and Mrs. Mary Haines, Mr. and Mrs. H. Habermann, Mrs. Lena Vondrum, and Dr. and Mrs. O. Bernhardt, all of Cassville, Wis. Mrs. Diener was survived by her husband; two sons, Leo J. and Arnold R. Diener, both of Dubuque, Ia; one daughter, Miss Esther Diener, of Dubuque, Ia; two brothers, John Richter, of Bloomington, Wis., and Joseph Richter, of Dubuque, Ia; four sisters, Mrs. John Kelly and Mrs. Anna Duve, both of Potosi, Wis., Mrs. Dora Jacobs, of Council Bluffs, Ia., and Mrs. Chris Schmitz, of Beetown, Wis; two grandchildren; and a number of nieces and nephews. She was preceded in death by her parents, one brother, and one sister. She was buried after 18 December 1941 at Linwood Cemetery, Dubuque, Dubuque, Iowa.